Final reminder that next Monday and Tuesday in San Francisco I’m teaching SEO class for AcademyX. The class is at 601 Montgomery St. #409, directly across from the TransAmerica pyramid. It is walking distance from the Montgomery BART station. The class goes for two days, from 9-4. You don’t need to bring a computer as there is one at every desk. They have a class description here, and a full outline of the SEO course here. Both of those pages have a button to REGISTER for the class. Remember, I’m only teaching the March 26-27 class, but you can use BENNETT to get 20% off any of the classes. 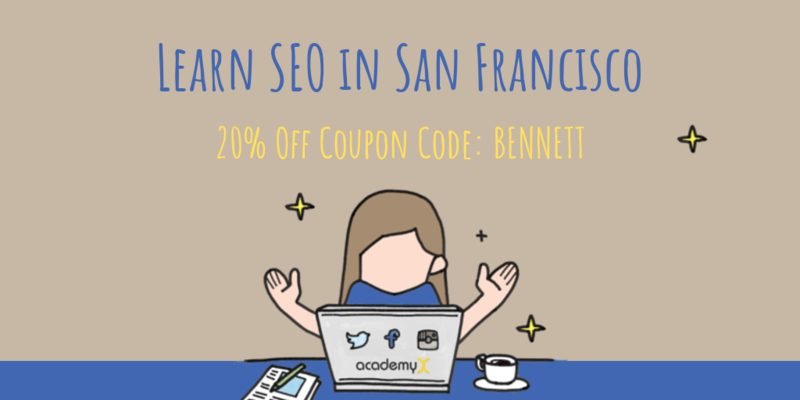 Special Price on San Francisco SEO Class!